5.11 Tactical Series in conjunction with Blackhawk Industries has designed pouches that will hold your equipment in the hidden pockets of the 5.11 Tactical Vest. The chest-high pocket allows for easy access. With a quick hand movement, you can retrieve your gun, baton, cuffs, extra magazine, flashlight or mace. 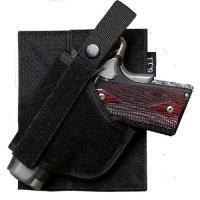 The pouches have a hook and loop backing that adheres to the inside of the vest pocket. This works really well with 5.11 jacket my wife bought me for Christmas. Once it is in place it doesn't move at all. Supports J frame air weight perfectly. CopsPlus was great to deal with... again.